Many wonder what a day at Hays Academy looks like. That is a great question and one you should answer if you have interest in attending one of our campuses. Hays Academy of Hair Design offers cosmetology training at campuses in Hays and Salina Kansas. Hays Academy has two Jr/Sr day events each year for those in the 11th and 12th grades. 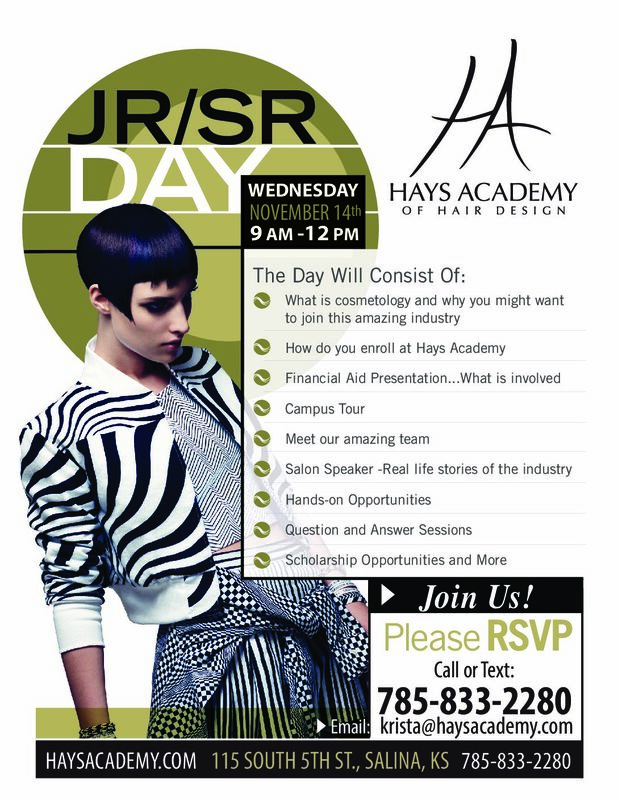 This event is an opportunity for those eager to find out more about what cosmetology school entails. This is a hands on look and listen to what a day at Hays Academy will be like. You will get to meet our staff and hear about financial aid, scholarships and real testimonies from those in the industry. In addition, students will get a campus tour and have some opportunities to get your hands in hair! This is a must attend event if you are pondering this industry choice! If you would like to RSVP for one of our Jr/Sr days, you can do that now! Give us a call at 785-628-3981 or email us. If you are interested in attending the Hays Campus event on November 7th, email Randi Gerstner. If you are interested in attending the Salina Campus event on November 14th, email Krista Waldman. Both of these ladies will be eager to help you! On a regular basis, we also host a “Crash the Class”. This is an event designed to give ANY prospective student the opportunity to come and shadow a current cosmetology student for the day. We have had great attendance at these and we are looking forward to hosting the next one on Wednesday, October 17th at both campuses. To RSVP, follow the directions above for the campus you are interested in. This event lasts from 9-12 and is an awesome opportunity to experience the industry first hand while seeing what a day in the life of a current student consists of. We will be providing pizza for lunch! Hope to see you on October 17th!